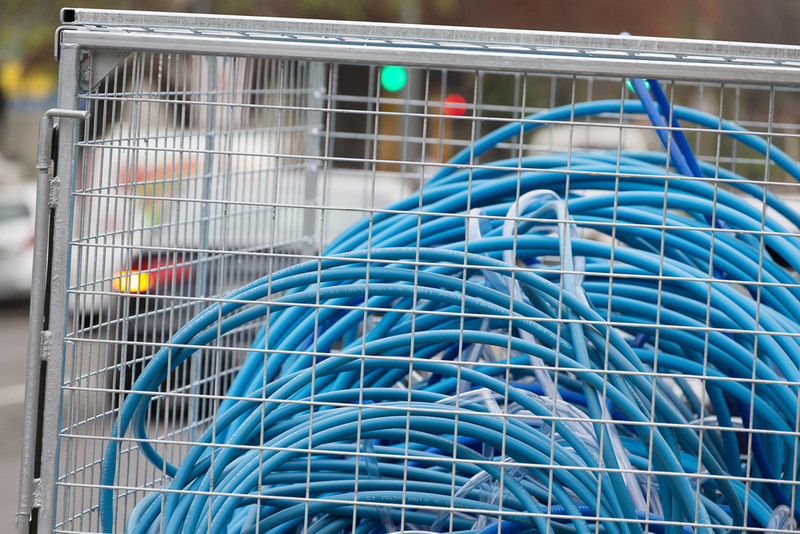 Pauline Rhodes, Mobile Tangles, 2015. Commissioned by SCAPE Public Art. Image courtesy of the artist. Photo by Bridgit Anderson. 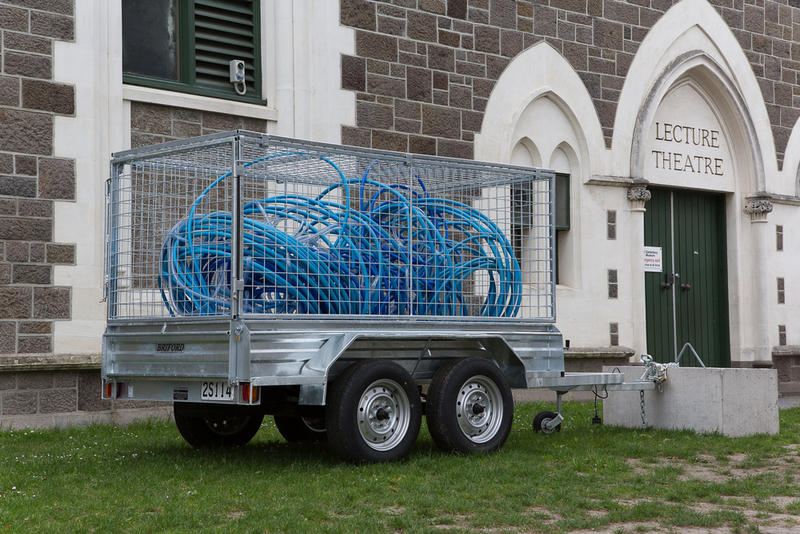 Christchurch artist Pauline Rhodes has created a series of three Mobile Tangles; portable installations which utilise materials common to the rebuild, including water infrastructure hoses, pre-cast concrete boxes, and tradies’ caged trailers. Whilst specifically designed for SCAPE 8 New Intimacies, the Mobile Tangles are also a demonstration of Pauline’s continuing engagement with the city’s waterways, tidal zones and geomorphology. The cage structure of the trailers and the water pipes give a subtle nod to Pauline’s first work for SCAPE, Ziggurat (2000), in which Waimakariri river stones were contained in wire gabions to form a pyramid structure. Whilst Ziggurat commented on the futility of trying to contain Canterbury rivers, now, in 2015 - post quakes - the bright blue twists of Mobile Tangles make another wry comment: the cages of the trailers, struggling to contain the hosing, mimic the way civic infrastructure constantly wrestles with the watery landscape of Christchurch. During SCAPE 8 New Intimacies, these works will be parked near the Ōtākaro Avon River, The Arts Centre of Christchurch, and the Canterbury Museum, in reference to the heritage architecture of these spaces. After SCAPE 8 has finished, the materials used in their making will be returned to the supply-chain and end up in use in the re-build of the city. Pauline Rhodes, Thank you Eva, 1979, Artist's Co-op, Wellington; photo courtesy of the artist. Pauline Rhodes lives and works in Christchurch. She studied at Canterbury University School of Fine Arts, graduating in Sculpture in 1974; and is highly regarded as one of New Zealand's most senior and leading site-specific installation artists. Recent exhibitions include Cones of Possibilities and Impossibilities (2014) and King Tides Rising (2008) at The Physics Room, Christchurch; Fluid Connections (2009), Jonathan Smart Gallery, Christchurch, and New Twists (2008), Bowen Galleries, Wellington. Pauline has contributed works to the Brick Bay Sculpture Trail in 2006, 2007, 2010 and 2012; and to Sculpture on the Gulf, Waiheke Island, in 2007 and 2009. Pauline also participated in the first edition of SCAPE Public Art Christchurch Biennial in 2000 with her work, Ziggurat.